With a few short sentences, it was over. 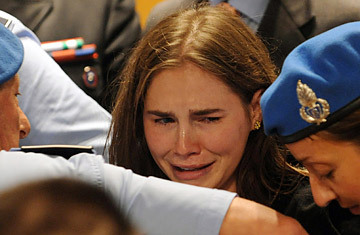 In a crowded courtroom in Perugia, an Italian court found Amanda Knox not guilty, on appeal, of the 2007 murder of her British roommate Meredith Kercher. Knox had spent the last few minutes before the judgment grimacing from stress and occasionally sobbing. She was found guilty only of slander  for what she had alleged was a forced confession  in which she accused a local nightclub owner of the assault, a crime for which she will be fined, but set free for time served. As the sentence was read, she collapsed into her lawyer's arms. She leaned sobbing against him as the judges absolved her former boyfriend and co-defendant Rafaele Sollecito. And then both were rushed out the courtroom by uniformed police officers to be taken back to prison, where they would be formally released. Outside the courthouse, however, Perugians who had gathered to await the decision began booing and protesting the verdict. Earlier that morning, Knox had entered the court to a flutter of camera shutters. After her lawyer had made a final plea for leniency, she said in a voice trembling with emotion, "I want to return home, to my life. I don't want to be punished, deprived of my future for something I didn't do." Sollecito was equally emotional. "The charges that have been made against me all these years were so out of place that somehow I thought they would just disappear," he told the court. "But it didn't happen. Somehow, I've had to bear everything, to carry on day after day, in some kind of nightmare. And I've never woken up from this nightmare." Knox and Sollecito have been held in prison since 2007, when they were arrested and accused of murdering Kercher, along with an Ivorian national named Rudy Guede. In 2009, Knox and Sollecito were both sentenced to more than 20 years. Guede, who was convicted in a separate trial, has had his 16-year sentence confirmed on appeal. The decision to free Knox and Sollecito came on a warm evening. The streets of the medieval city of Perugia were lined with satellite trucks, and outside the courtroom police had deployed metal barriers to keep the press and public from pushing against the courthouse entrances. But outside the media-packed historic city center, coverage of the trial was relatively light. While the fate of Knox and Sollecito were receiving wall-to-wall coverage in the U.S., the Italian media were treating it as a foreign news story  interesting primarily because it happened to be taking place at home. To be sure, the national broadcaster opened its evening newscast with a short segment on the case, but on the major newspaper websites, coverage slipped down, elbowed aside by news of a setback for Silvio Berlusconi in his own trial (for engaging with an underage prostitute), then buried under reports of a collapsed building in the south of the country. Indeed, as a nod to the international nature of the interest, when the Italian lawyer for the Kercher family gave a press conference, he spoke in English and asked for translation to be arranged for the domestic journalists. If there was a local angle, it was a feeling of resentment over the treatment in the American media of the Italian justice system. During the long coverage of the case, television anchors in the U.S. seemed to display contempt of Knox's treatment, in tones akin to that of a British colonial officer standing over the Black Hole of Calcutta. In her morning plea, Knox herself alluded to her sense of unfairness about the treatment she received. "My absolute faith in the authority of the police has been betrayed," she said. "I've had to cope with absolutely unjust accusations, elusive, without foundation, and I am paying with my life for things I did not commit." Many Italians have bristled at being judged by the land of O.J. Simpson and Casey Anthony; in the closing arguments, one lawyer for the prosecution called attention to the fact that at least Knox didn't face the death penalty. And so when members of the Kercher family expressed their faith in the system, the news was greeted with pleased satisfaction. While recent polls have shown that the majority of Italians believe Knox and Sollecito are guilty, others will take comfort in the fact that the justice system can be said to have worked. "Amanda Knox's case demonstrates how the system is able to react to any errors," says Paola Severino, a lawyer and a professor of criminal law at Rome's LUISS University. "Whatever the result of the original sentence, the accused is guaranteed to be able to be heard by another completely independent judge." Knox's travails are not yet completely over. The Italian justice system has a second level of appeals, in which a court case reviews not the facts, but the legality of the judgment. And Knox's prosecutors have pledged to take the case upward. The difference is that this time, rather than following the case while confined in an Italian prison, Knox will be free to go home.